If you're having trouble using MonkeyMote, wish to report a bug or suggest a new feature, please email Support or send a message via Facebook. Support requests should include a detailed error description and mention which media player and device you are using. Always make sure to use the latest version of the app as well as its corresponding plug-in and media player. In some rare cases you may have to adjust your router's configuration as well. For the automatic discovery to work, Apple's Bonjour service needs to be running on your PC. It is typically installed automatically alongside iTunes. A firewall may prevent the automatic discovery feature from working reliably. Should the automatic service discovery fail or you would like to set a default connection, then you need to create a manual connection. This requires you to enter your computer's IP address. A list of network adapters and their addresses is shown in the plugin configuration dialog. 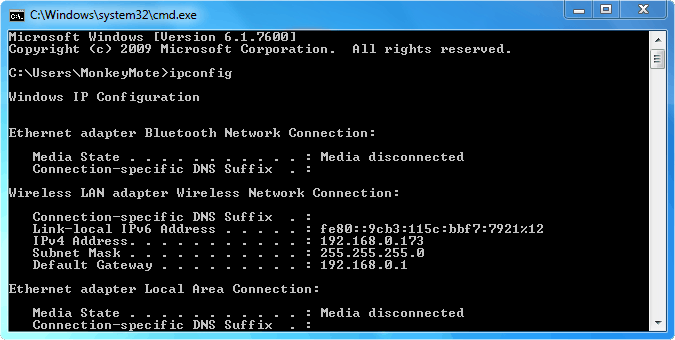 Alternatively, you can open a command prompt and enter ipconfig. In the example below, the IP address to use is 192.168.0.173. Please note that, depending on your network configuration, your computer's IP address might change after a reboot. MonkeyMote by default tries to use the album artist tag when collecting a list of albums in the media library. If your files are not tagged properly, you may run into problems with albums containing tracks by several different artists. This can be resolved by either re-tagging the albums in question (e.g. using TagScanner or Mp3Tag) or toggling the Prefer album artist option in the plug-in settings. In some cases MonkeyMote will be able to connect to a running JRMC instance, but will behave erratically. For example, it may not react to track or volume changes. This is most likely to happen when two different versions of JRMC were installed at some point, e.g. when upgrading. To resolve this issue, fully uninstall and then reinstall both JRMC and MonkeyMote. When upgrading to a newer version of JRMC, always uninstall the old version first.